Thanks for your kind letter. I’m glad that . . . Wait. 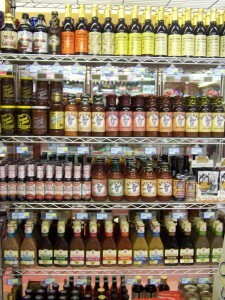 You have a favorite condiment? And it’s . . . ketchup? There’s relish, mayonnaise, croutons, horseradish, baco bits, jalapeno, chutney, and so much more. 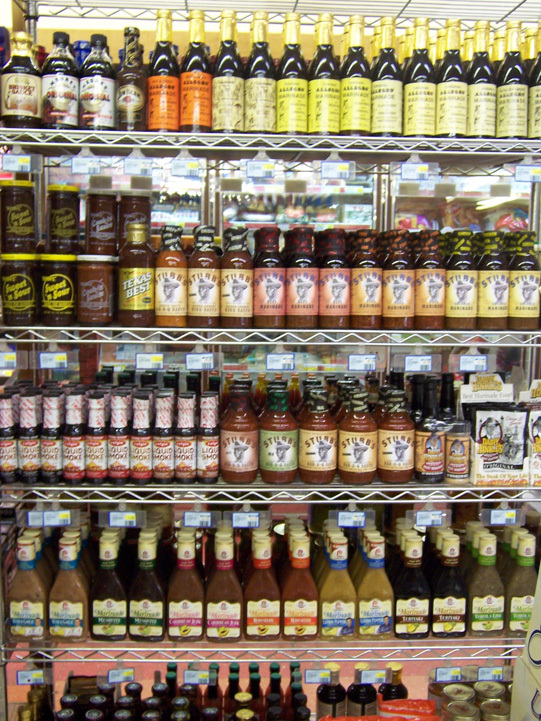 That’s not counting the various sauces out there, from soy to tabasco to au jus. Or even everyday dressings, like thousand island or tahini. Not to mention the madcap craziness of nutella or vegemite. No, favorite condiment is a huge decision. Not something you want to take lightly. I’m not criticizing you, Kyle. I’m sure you’re a decent human being. But ketchup? Please ponder more deeply. Anyway, I may have possibly gone off on a slight tangent. My apologies. Thanks for your ideas for future books. As you probably know, I like to try different kinds of writing, from picture book to young adult, but so far I haven’t done much of anything with monsters or aliens. That may change — in a peculiar way — with the book I’m currently writing. I’d love to tell you about it, but I have a rule about these things: Don’t talk about books until the first draft is finished. This might sound strange, but I always worry if I’ve got another book left in me. Even when I start strong — and I usually don’t — I’m never 100% confident that I’ll finish it. That those scribbled words in a composition notebook will actually turn out to become a real book. I think the worst thing I can possibly do is to TALK about a book that isn’t finished; it puts the jinx on it. So though my next book doesn’t have monsters or aliens, there will definitely be a reanimated corpse or two. That’s all I can tell you so far. I am reading Bystander to a grade seven class and I would love to have followup activities and/or discussion questions that I could use during the reading of the book. I have downloaded the resource that you posted for after the book is finished and I will be using it. Do you have anything that I could download to use with the students during the reading as I hope to read to them once a week? Oh, and by the way, the students LOVE the book so far! I’m sorry, Colleen, but I don’t have any further materials to help in your classroom. That said: Do you Skype? I’m in the early stages of exploring this new way of reaching students, classrooms, schools, and I’d be willing to try it out with your class if you have the technology. We could do a 20-minute Q & A, something like that. 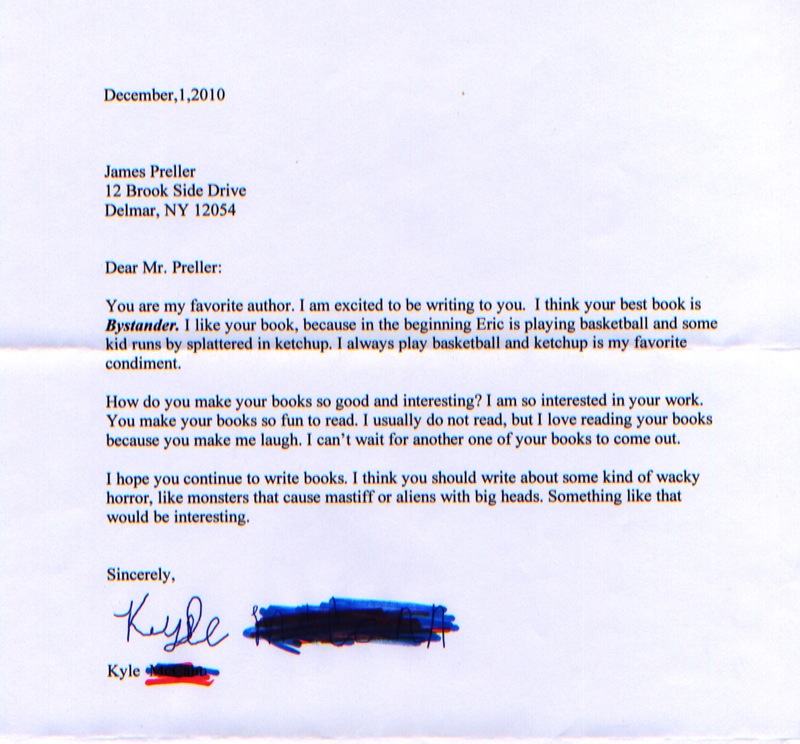 That is, here at jamespreller.com, we try to reward our most faithful readers! Seriously, to all concerned: I am dipping my toe into the Skype waters, and feel like reaching groups/classes that have focused on ONE BOOK is the ideal use. It may turn out that I hate Skyping, but for now, color me curious.